The perfect combination of size, speed, and presence, a good power forward can change the complexion of a hockey franchise. Legends like Peter Forsberg and contemporary bigs like 2011 MVP Corey Perry smother defenders on the forecheck, don’t shy away from contact in the corners, and are immovable enough to provide screens or position themselves for rebounds in front of the net. In previous NHL games, their general ineffectiveness made them the first guys I dumped in Be A GM mode – they weren’t fast enough to escape contact, and smaller players could easily knock them off the puck. Thanks to the addition of net jostling and a tweaked physics engine that makes it tougher for squirts like Daniel Briere to upend guys who tower over them, the power forwards are once again relevant in NHL 12. The refined physics and net battles are just two of the many great improvements to the gameplay this year. With under-the-hood signature traits determining how an AI-controlled player should react, your teammates become more involved in the attack. Offensive defensemen join the rush, pass-happy centers hole up in Gretzky’s office behind the net, and snipers put themselves in position for one-timers. With goalies fighting to see through screens and pucks rebounding off their pads more naturally, NHL 12 has the most diverse goal scoring I’ve seen to date. However, some goals aren’t deserved. Refs blow calls regarding goaltender interference (leaving an open net), and defensemen are too lax in denying wraparounds or cuts toward the crease. Hopefully, developer EA Canada can address some of these problems with the downloadable tuner updates. Be A Pro mode benefits the most from the new gameplay improvements. Since the revamped player AI is much more engaged in the offensive zone, it’s easier to trust your teammates and pass them the puck. The new in-game task system also helps the mode feel more dynamic. If your team is behind one goal in the third period, your coach may encourage you to even up the game and reward extra experience points for doing so. The only major gripe I had with the mode was how it determines playing time. My rookie center played on the first line and led the NHL in scoring, but the coaches still didn’t trust him enough to skate a power play or penalty kill. While moving up the ranks in Be A Pro, players unlock nine legendary NHL players like Wayne Gretzky, Ray Bourque, and Patrick Roy. Though it’s fun taking these stars for a skate, Be A Legend misses the mark by placing them on contemporary teams instead of recreating the retro vibe like 2K Sports did with NBA 2K11’s Jordan Challenge mode. I’d rather get a hockey history lesson from commentators as Gordie Howe takes the ice with Sid Abel and Ted Lindsay than watch him pass the puck to The Mule and Dan Cleary. The franchise-style Be A GM mode also aims for the net but ends up shattering the Plexiglas. For the second year in a row, trades, free agency, and drafting all need major overhauls. AI-controlled GMs still propose boneheaded trades, above-average players in their prime still get stowed away on minor league rosters, restricted free agents (like 2011 number one overall draft pick Ryan Nugent-Hopkins) sit out entire seasons, and some teams even let their highly rated prospects enter free agency rather than signing them. The biggest problem with the mode may be the top-heavy player ratings. When even below average fourth-liners like James Sheppard are rated above 80, you have too large a grouping at the top of the skill spectrum. It gets even more overpopulated when young players improve as years go by and aging players don’t receive a commensurate drop-off. By the fifth year of my career as GM, it wasn’t uncommon to go against teams that had 100 ratings in offense, defense, or both. These mistakes take away from an experience I would otherwise enjoy thanks to its spot-on player development, farm system management, revamped injury system that includes more short-term injuries (which forces you to juggle your lineup just like a real club would), and improved sim results. The two other NHL destination modes, the EASHL online hockey league and Hockey Ultimate Team collectible card mode, maintain their high quality by making a few small but welcome tweaks. It’s now easier to match up against friends in HUT matches, and a position change card helps you improve your team chemistry without relying on lady luck to deliver that highly rated NHL right winger when you already have two left wingers you could put on the ice. The EASHL sharpens its skates with a more gradual progression system and the ability to reconfigure your skills based on the position you are playing in the game at hand. 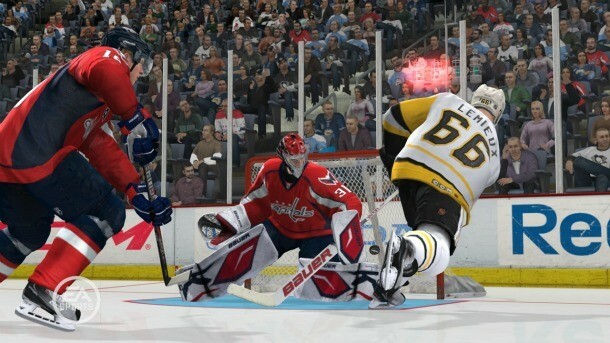 Though the Be A GM mode needs a major overhaul and the new Legends feature falls flat, NHL 12 is still strongest where it counts – on the ice. Just like a well-rounded power forward who can dominate in all three zones, you can’t deny the benefit this brings to the club. 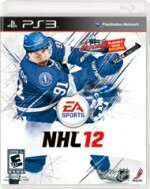 falls flat, NHL 12 is still strongest where it counts – on the ice.